The term “vintage” when applied to rugs, is used to describe those seeped with nostalgia “retro rugs” that were produced during the mid 20th century and for the most part, through the 1970’s. Since 1980, the Nazmiyal Collection has been building up one of the world’s largest and most extensive collections of vintage and mid century rugs in the world. With over 3,000 pieces our comprehensive selection of vintage mid century rugs includes beautiful vintage Moroccan rugs, exceptional mid-century vintage Scandinavian rugs and breathtaking vintage Art Deco rugs. Our extraordinary diverse collection reflects the wide range of rugs and carpets that fall under the designation of “vintage rugs”. While there is no single set of aesthetic values that defines the “vintage rug style”, there are rugs as different as an abstract Beni Ourain runner and a minimalist Swedish carpet. These are all considered to be vintage rugs – so regardless of your personal taste or vintage aesthetic, there is surely a vintage mid century rug in our collection that suits you. Rugs that are considered “vintage” showcase what the mid 20th century was largely defined by – the experimentation and innovation in the arts, industries, the sciences and popular culture. Typically, a mid-century area rug is a rug or carpet that was produced between the 1920’s and 1970’s. These rugs explore the boundaries and push the limits of textural and visual style to create designs that provide a strong sensory experience and can quickly change the look and feel of one’s interior home design. Over the past several years, there has been a substantial increase in the popularity of certain types of vintage rugs. In the 21st century, the world has a renewed interest in mid century modernism, and vintage rugs have been returning to the forefront. 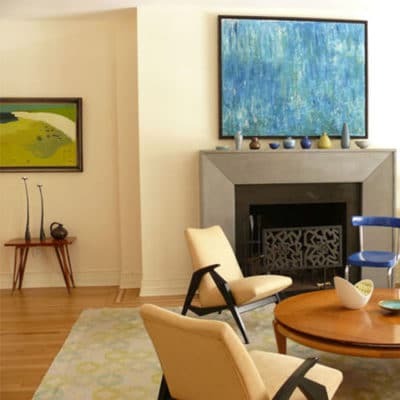 This has created a surging demand for authentic mid century works of art. Of course, by their very nature, genuinely vintage rugs and carpets exist in a fixed number. Although modernized productions continue to come out, despite how authentically “vintage” its design is, it is not, by definition, truly vintage. Vintage rug styles are exciting and dynamic examples of the various artistic developments of the mid 20th century, and each own have their own story to tell. The diversity seen in these productions may be one of the secrets behind their renewed popularity. These marvelous carpets feature formal geometric motifs, whimsical folk-art influences and colorful Deco inspired designs that are truly abstract. Whether collectors and designers are seeking a luxurious long-pile Rya or charming flat-woven vintage rugs from Scandinavia, the most versatile and colorful rugs, make superb statement pieces. Mid century modern rugs, as opposed to antique rugs, includes abstract, pop-art, artist designed, surrealist and minimalist styles. These vintage rugs were able to set or keep pace with the ever changing interior decor trends. In many ways, the new and innovative trends that were developed during the mid 20th century, were based upon a revival of folklore and traditions that were turned on their ear to become a new genre. In Paris, Le Corbusier popularized this revival of the old and unusual. He was able to do so by transforming the abstract and textural Berber carpets into high-design pieces. While in Scandinavia and Denmark, the patrimonial Danish design trends reached an unprecedented level of global popularity through manufacturers like Ege as well as other professional weavers. Like the aesthetic movement of the late 1800’s and the Luddites (who destroyed the British power looms in the early 1800’s), the artists and master weavers who created mid century modern rugs during the mid 20th century also rebelled against the increasing industrialization of carpet production. Ege Rya and other manufacturers used hand-made woven techniques borrowed from Axminster to produce durable machine-made rugs and shag carpets. Meawhile, a separate group of designers were dedicated to producing hand-made carpets and involving themselves in all aspects of production. Ironically, the designers specializing in handwoven vintage rugs have often been the product of industrialization. These designers were schooled in industrial design and textile art production to meet the growing mid century modern demands. The designers developed their own unique styles which often included influences from local or regional history and folklore. In recent years, mid century vintage rugs such as Moroccan rugs and Scandinavian rugs have swelled in popularity for a wide variety of interiors. Most notably, a mid-century modern decor benefits best from these artistic masterpieces. They can draw a room together, transforming it from sparse and minimal to cozy, inviting, and luxurious, without breaking the bank. Their popularity comes from their ease of use and the wide range of color palette options, not to mention their uniqueness in design. Indeed, the fact that these vintage rugs are as desirable as they are is a testament to two things: first, to the incredible craftsmanship that went into the original composition; and, second, to their enduring beauty. Vintage rugs from Sweden and Morocco are among the most desirable and sought after commodities in the art word, and are one of the greatest values. Swedish rugs of the early and mid 20th century are hugely sought after due to their incredible artistic qualities and superior craftsmanship. Swedish weaving tradition reaches back hundreds of years when encounters with eastern civilizations taught Scandinavians how to create the lushly woven, warm Rya rugs that are still made today. 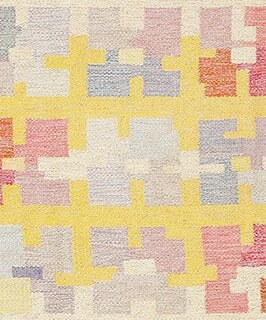 In the 20th century, aesthetics evolved and the Swedes called for flat-woven kilim rugs with simple, geometric patterns. Rollakans, as they are called, are Swedish national treasures, and many of the vintage pieces we might buy for our home were created for government funded regional Arts and Crafts fairs. For Swedish rug designers in the early 20th century, the production of rugs and textiles was raised to an art form, which had a great international appeal. A fresh and appealing aesthetic was sustained during the first half of the 20th century by the weaving of the celebrated Swedish carpet designer, Marta Maas Fjetterstom and her peers. The simplicity and purity of design in vintage Scandinavian rugs gives them an immediate relevance and contemporary allure. The establishment of Marta Maas Fjetterstrom Atelier in 1919 was quite possibly the most impactful thing to happen to the Swedish Rollakan. Fjetterstrom got her start as a weaver at one of the aforementioned regional Arts and Crafts fairs in Malmohus, but her talent soon became too big for the small town and she moved to greener pastures in Vittsjo. When her work was featured in an exhibit in Malmo, she was noticed by Ludvig Nobel (brother of the founder of the Nobel Prize) and under his patronage, she moved to a new workshop in Bastad where she lived until her death, weaving masterpieces and training prodigy in the likes of Barbro Nilsson and Marianne Richter. Scandinavian rugs are unique because they feature modern contemporary motifs and minimalist elements. Artists that specialized in the creation of these rugs chose to showcase modern design elements as a way to create character in their masterpieces, setting them apart from the more convoluted rug patterns developed by Persian and Turkish artists. Many of these rugs were designed to hold an area together, and some were even made with previously discarded cloths or rags to symbolize the beauty of rebirth. These vintage Scandinavian rugs were often rougher in their texture and appearance, but they featured many of the same basic design principles that became popular in the Scandinavian style of weaving. 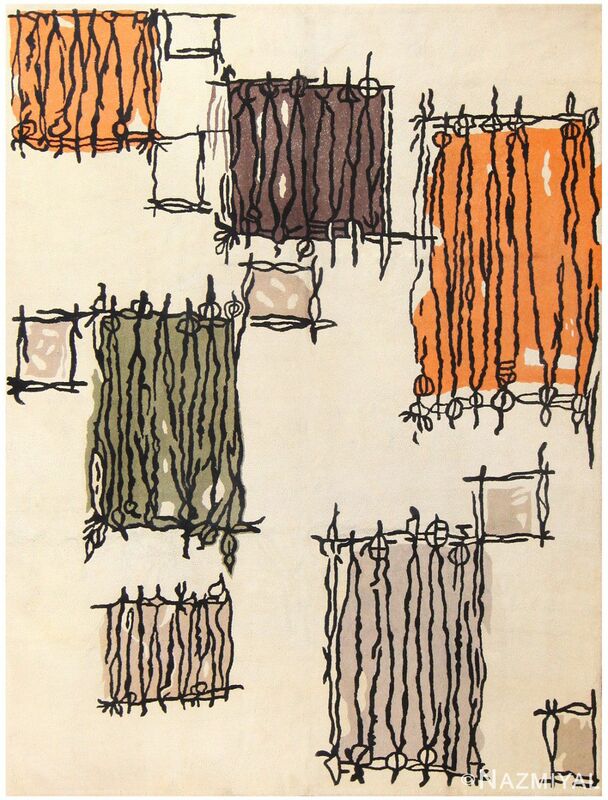 Relatively simple colors and shapes dominate the landscape on these mid century rugs. These carpets range in size and form, and it is not uncommon for some to be as long as runner rugs. Elemental hues like blue, stone and green play an integral role in shaping the surface, though it is not uncommon for many of these distinctive pieces to come with warmer colors to offset the cool tones. The colors used in the rugs are often muted as well, although this does not allow the rug to stand out very well as a centerpiece, rugs can complement existing furnishings quite as adroitly as Scandinavian ones. 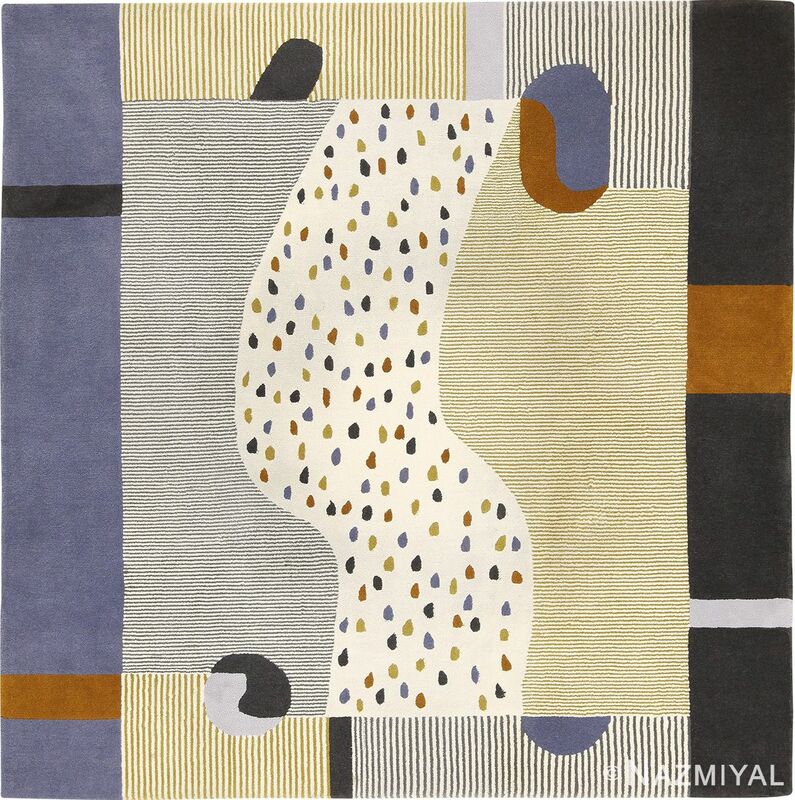 The Scandinavian mid century rugs typically feature a unique mixture of lines and movements based on these shapes, and often artists will use the borders as an effective way to guide the viewer. Depending on the primary colors and motifs, it is easy for decorators to apply the rugs to small spaces, especially if there are matching articles of furniture nearby to synergize with the theme. Because of their muted appearance, they can work well on hardwood surfaces and with more vibrant colors as they naturally lead the eyes along their forms. Primary shapes used in the design of these rugs include basic squares, triangles and circles. 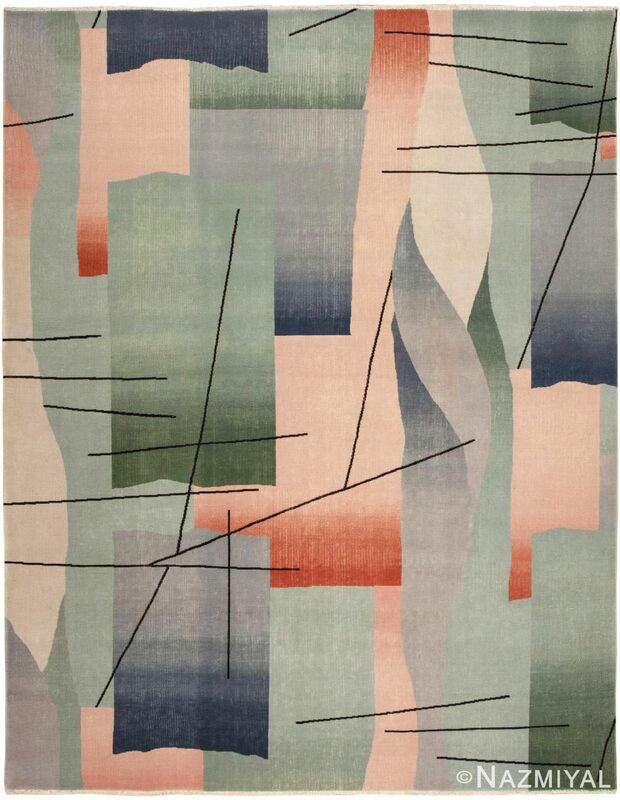 Because these rugs use so many simple shapes, artists can exercise more creative freedom in their application. 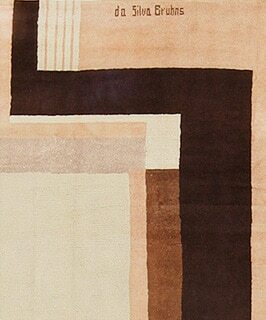 The straight lines and rigid forms in the shapes can guide the viewer’s eyes from one section of the rug to the next. These rugs rose to popularity during the Art deco movement, an international design movement ranging from the 1920’s to the 1940’s. This was one of the most unique and expressive art movements in the history of the world, enticing both collectors and observers. Art Deco pieces are defined by their bold use of color and form, blending the line between the abstract and the concrete, in addition to their massive range of borrowed influences. All of these traits and characteristics come together to create a style unlike any before. Some of the most obvious visible influences include cubism, modernism and constructivism. These forms come together to create a more flourished sense of movement without betraying too much of the original composition. Because of the varied nature of these rugs, they are particular adept at standing out as a focal center in the room. As long as you choose a stylish rug that can define the atmosphere you want to establish, you cannot go wrong with the presence of the surrounding elements. Art Deco rugs are meant to draw attention and stand out, regardless of the other furnishings. Always decorate with a sense of contrast in mind, no matter how subtle or pronounced. These rugs can effortlessly fit into all types of modern home decors, but they are meant to clash against neutral spaces in order to better define the environment. Practice arranging them against different furnishings to see what type of effect you can get. Keep the size and texture of the rug in mind as well. Some rugs work better with longer threads, depending on the subject matter presented on the rug’s surface. Some of the simplest rugs use wild, arching movements to create form while relying on the sections of negative space to reveal texturing. Colors are often chosen for their boldness, and there is almost always a fascinating juxtaposition of lighter and darker tones. The same contrasting themes appear in the presentation of lines. It is not uncommon for these rugs to feature no borders, instead relying on the appearance of multiple angular lines in their core to break up otherwise flowing and whimsical movements. These innovators of classical modernism influenced the trends that supported the popularity of these carpets during the mid 20th century. The functional, luxurious rugs of the past were replaced by modern fresh new statement pieces that were elevated from their standard purpose as decorative floor coverings and were featured and celebrated as works of art. Vintage mid century Moroccan rugs, are classic and elegantly understated tribal works that almost always feature volcanic colors that create contrast and define dynamic forms within. These rugs are highly sought after because of their role in Moroccan history. The vast majority of Moroccan pieces available on the market have been crafted by indigenous people. 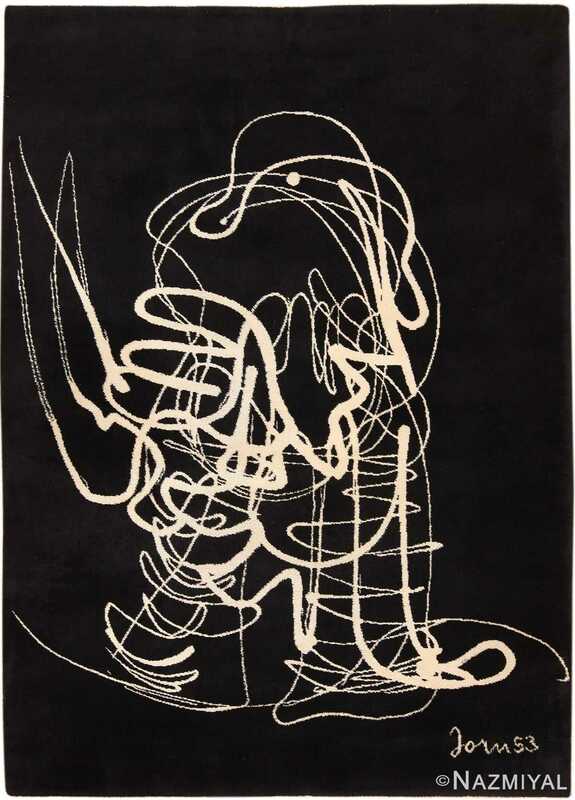 These artists usually create these rugs more out of necessity and less out of artistic intent, and most artists do not seek or possess any formal degree of artistic training. 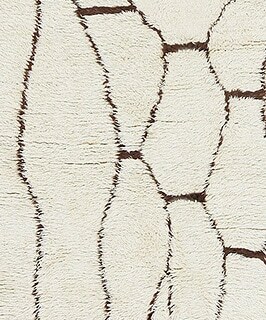 For example, it is not uncommon for some thinner rugs to have also been used as saddle blankets by nomads. These mid century rugs frequently feature very simple forms and patterns within, though the color choices might result in more pronounced degrees of contrast that lend further character. These rugs often feature thick textures with a heavy pile, which makes them particularly well-suited to snow-capped mountainous regions. Thinner rugs are usually designed to suit hotter environments. Generally, these two opposing textures dominate catalogs in terms of popularity and functionality. Most of the designs chosen for the mid century rugs vary from artist to artist, as they have been passed down from generation to generation by weavers in the family. 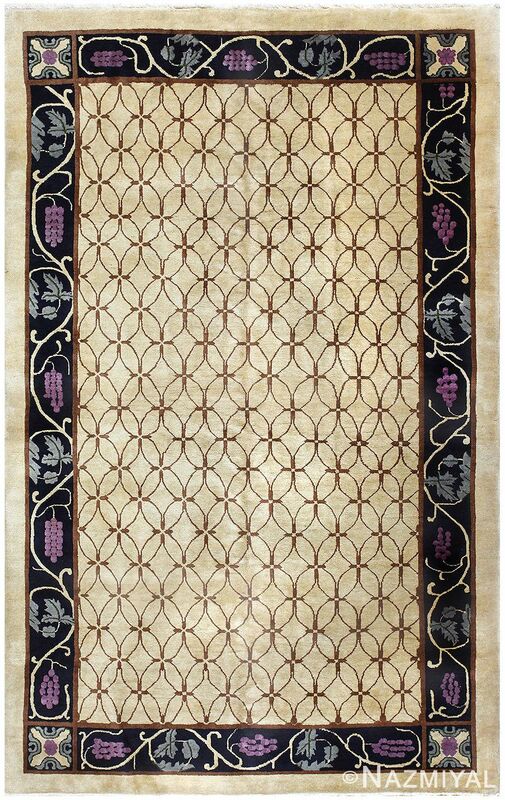 Some of the most common foreground motifs present in these rugs include angular floral shapes and diamonds set on top of a relatively bare background. These pieces work well with modernist decor because they can effortlessly fit in with a broad variety of themes and colors. Whether set as an accenting point between two centerpieces or arranged to encourage the eye to follow an accommodating vista of complementing rugs, these options can add a tribal appeal to the room. Because these rugs do not emphasize complicated forms, they are best set with relatively minimalist environments. The muted colors in particular can lend an air of soothing tranquility to the room, which makes this style of rug exceptionally desirable in areas like kitchens and bathrooms. Studies and offices can also benefit from these rugs, especially if they are set alongside other tribal pieces of art, such as furniture, paintings and tapestries. Hooked rugs are beautiful rugs that are crafted through the art of pulling fabric or yarn loops through a stiff base material, such as linen or burlap. These loops are pulled through the material on the back through the use of a hook tool. This technique results in significantly enhanced precision, allowing artists to control just about every aspect of the creation process. They can choose between the right colors, gradients and positions to get extremely accurate renditions of scenes from nature. These mid century and antique rugs are native to North America, and they have been a popular part of the region’s artistic history for the past two hundred years. Because of the classical appearance of these rugs, they are often chosen to act as centerpieces or soft accents to ornate and traditionally decorated homes. Each rug is a timeless work of art, and there are many collectors who value specific styles and artists because of the classic and traditional feel that comes with each rug. The use of free color is often a prevalent and major component of the creation process. Artists focus on concrete images from life more often than they do artistic motifs and patterns, though it is not uncommon for patterned hooked rugs to feature large images of flowers set along loose borders and amidst light neutral landscape. These rugs may be circular or rectangular in shape, which means that decorators can arrange the rugs based on the outward lines and how they work with surrounding furnishings and decorative elements. Because of the large images rendered on the rug, decorators can allow them to stand out as centerpieces on their own. Many traditional hooked rugs stand out as powerful focal points in dining rooms and dens, and darker, patterned options can work well in the bedroom by establishing a more classical form for the rest of the room’s furnishings to follow. If the patterns on the rug are smaller, it is best to use the rug as an accenting piece that can guide the viewer’s eyes to other sections of the room, such as leading up to another larger work of art. Spanish rugs are among the most varied and decorative rugs available. 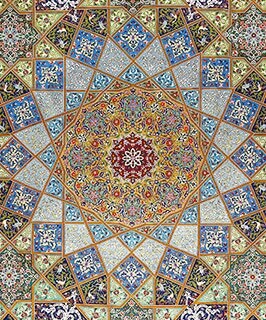 They feature a unique medley of foreground elements and motifs, most notably floral and pomegranate shapes that are inspired by traditional Muslim influences from the country’s history. 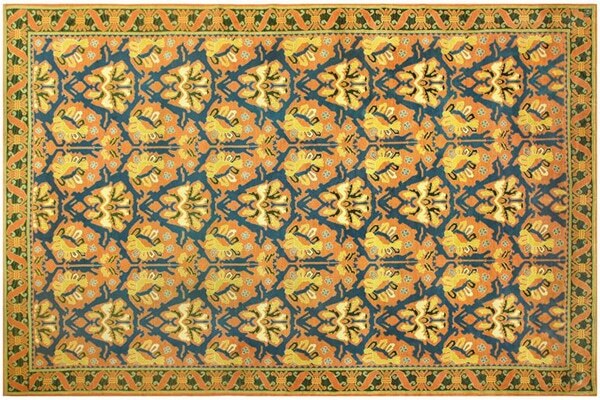 As the country experienced more and more cultural changes, weaving techniques began to change as well, and artists began to incorporate more sweeping visual effects in their rugs, varying the thickness of borders and sometimes going as far as to break away from the rectangular framework to create whimsically flowing shapes along the edges of the rug. Though many Spanish rugs feature classical patterns and repeated motifs, there are many that showcase concrete images, such as gardens and naval scenes. Many of these rugs focus on contrasting colors to create stronger points of interest and contact. 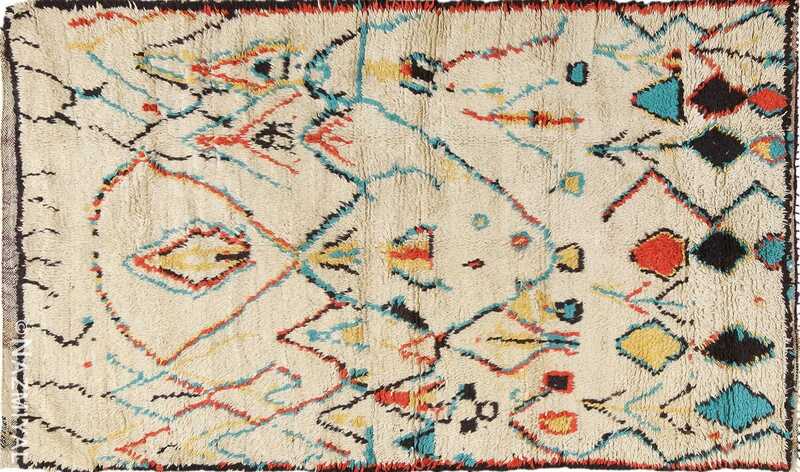 These are most prevalent between the borders and hearts of the rugs, where lighter elements clash with darker ones to draw emphasis to the specific figures. Gold, cobalt, crimson and black are among the most commonly used colors, and they are often arranged around each other in order to maximize their effect while simultaneously supporting the regal and dream-like environment. In rugs where the images are rendered clearly to display flowers and trees, many of the borders and rigid lines are arranged around the imagery to lead the eyes towards them. When decorating with these beautiful rugs, be sure to focus on the specific images chosen to define the inward space. Spanish mid century rugs that display clear vistas of flowers, trees and wreaths should be arranged around traditional furnishings in order to emphasize the classical appeal. These mid century rugs are meant to almost blend into the room’s environment, all while standing out upon closer inspection. In such a subtle way, decorators can practice working with subdued focusing and contrasting to allow the imagery to stand out, even when set with similar furnishings. More patterned rugs may work better in more overt ways, such as by setting the rug as a contrasting centerpiece in a traditional or fusion environment. Darker colors can work particularly well in contemporary homes, particularly those that put emphasis on negative and positive space between different articles of furniture. Like the classical Art Deco rugs developed by European and Middle Eastern weavers, the 1920’s were a bold time of creation and experimentation for Chinese weavers. Art Deco Chinese rugs differentiated themselves from many other rugs created during this era because of their motifs. While they were just as experimental in their use of color as European and American models, Chinese rugs focused more on classical figures and elements in Chinese mythology and culture. Many mid century and antique traditional Chinese patterns were worked into these rugs in order to preserve the heritage while still providing the weaver with plenty of room for creative expression. Bright and eye-catching colors were popular during this period. Neutral tones like black, gray and white were set marvelously as backgrounds to more vibrant tones of blue, red and gold. These colors came together to create an almost pottery-like effect in the rugs, which resulted in an even more pronounced air of royalty. These rugs often featured strong borders that themselves contained plenty of the decorative motifs that were arranged at the centers of the rugs. Usually only several colors were chosen for the rug’s design, and it was not uncommon for some carpets to only feature two or three colors to define the rest of the scenery. When decorating with these rugs, try to make them the focal point of the environment. Many of these rugs are not designed to work as accenting points because the elements on the surface seem to tell a story in the arrangement of the motifs. The primary colors on the rugs can be a powerful way to define the rest of the décor, as there are enough connections between the varying elements to stand out amidst similar furnishings. Let the other furnishings lead the eyes to the rug, especially in a room that showcases plenty of negative space. Our eclectic, comprehensive selection of vintage rugs includes the most popular and the most sought after vintage carpet and rug styles, including extraordinary pieces from Morocco, dynamic and exciting pieces from Scandinavia, and stunning Art Deco compositions from Europe and Asia. 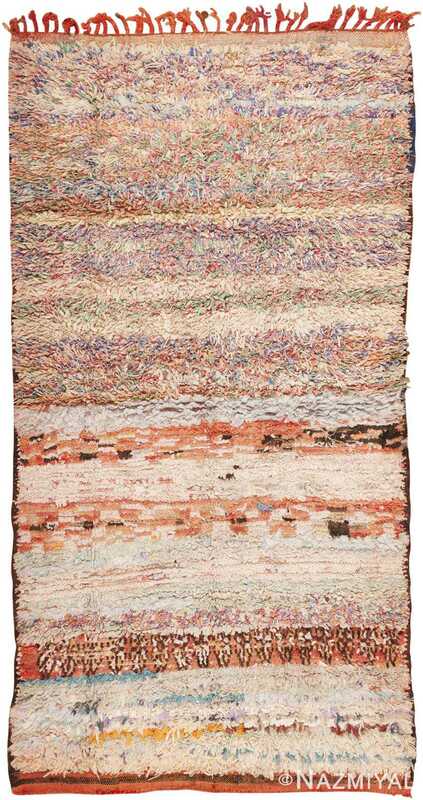 Perhaps one of the most intriguing – and unique – characteristics of the variety of pieces that receive the “vintage rug” designation is just that: their incredible variety. A mid century vintage carpet may be characterized by a monochromatic, bare field, as is often the case in Deco Vintage carpets from China. A Vintage Room by Home Caprice shows beautiful bold colors and eclectic furniture. Meanwhile, a vintage carpet from Scandinavia may feature traditional, regional design elements, arranged in a novel manner. All that is to say that there is no practical limit to the variety of aesthetic values that one can find among vintage rug styles. Vintage mid century carpets and rugs from the mid 20th century have never been as popular as they are today. Available in a wide variety of designs, styles, colors and materials, vintage mid century modern rugs and carpets complement almost every type of interior decoration. Many people erroneously use the words, “vintage” and “antique” rugs to mean the same thing. Generally speaking, the word “vintage” denotes sometime in the past, but not so far back in the past as to make them antique. To remove confusion, the label “vintage”, has been given to items that are at least 40 years old but not older than 80 years. Mid century design perfectly complements the culture, style, and mood of vintage rugs. In the case of rugs, those made during the period spanning from the mid to late 1930’s through the 1970’s are called vintage rugs. The mid century was a great time for innovations in art, science and popular culture and the mid-century rugs reflect the cultures, styles and moods of the time perfectly. One can easily find vintage mid century rugs that were made in Turkey, Iran, India, Morocco, China and just about everywhere else in the world. These carpets reflect the styles and looks specific to the place of origin as well as the time period. 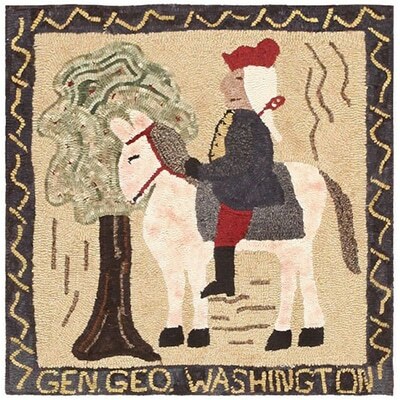 You can find rugs from early America, to Europe, Asia, Africa and more. Vintage rugs and mid century carpets are not so old that nobody knows when or where they were made. In fact, before buying a vintage rug, you should inquire about the era and location it was made. Knowing this will tell you about the design and style of the rug and may help with planning your interior decoration accordingly. This large Spanish Rug is beautiful with it’s deep gold tones and blue patterns popular in the 1930’s. For example, the 1930’s vintage rugs from France may have patterns and motifs inspired by art deco rugs, which was popular at the time. 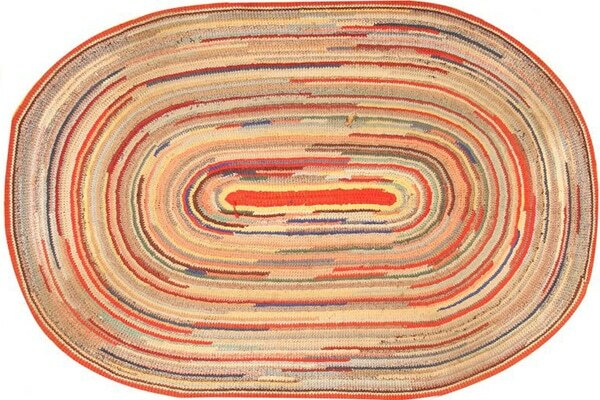 That said, the rugs from the late 1960’s may be inspired by the pop art movement, which was making waves at the time. The word “vintage” does not exclusively indicate a particular time in the past. The term itself can also be understood to mean that the specific vintage design and style was popular in a certain time in the past. Many manufacturers take advantage of this fact by creating products that are the exact replicas or reminiscent of products that were popular in the past and market/label them as ‘vintage’. Thus, not all vintage rugs you can find in the market are true mid century vintage rugs, although they look vintage enough. Vintage carpets and mid century rugs come in such as wide variety of designs, styles and patterns that you can fit them in every type of interior decoration, including traditional, modern, contemporary and ultra-modern. This is the reason for their popularity. At Nazmiyal Antique Rugs, we have long been admirers of mid century vintage rugs – which seem to be becoming more and more popular every day. Over the past ten years or so, there has been a marked increase in the popularity of all things “vintage,” a trend that has influenced just about every field of design. 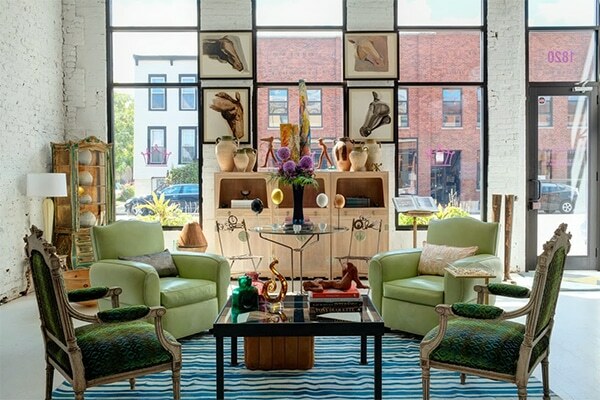 This renewed interest in mid-century and modern aesthetics is difficult to overstate, as more and more consumers have been purchasing authentic “vintage” products – products that are, by definition, part of a finite pool. Thankfully, the mid century vintage carpet collection here at Nazmiyal Antique Rugs was built alongside this rapid increase in the demand for vintage goods. As a result, our collection consists of the sort of authentic, vintage pieces that are most highly in demand. From our genuine Marta Maas Fjetterstrom rugs from Sweden to our iconic Beni Ourain / Moroccan rugs, our Vintage Rug collection is sure to surprise and delight anyone with an expressed interest in all things “vintage.” From minimalism, to art deco, to abstract expressionism, the list of modern art styles reflected in vintage rugs and mid century rugs is as extensive as it is varied. Search through our collection of vintage rugs and mid-century carpets and discover the exciting world of vintage design! 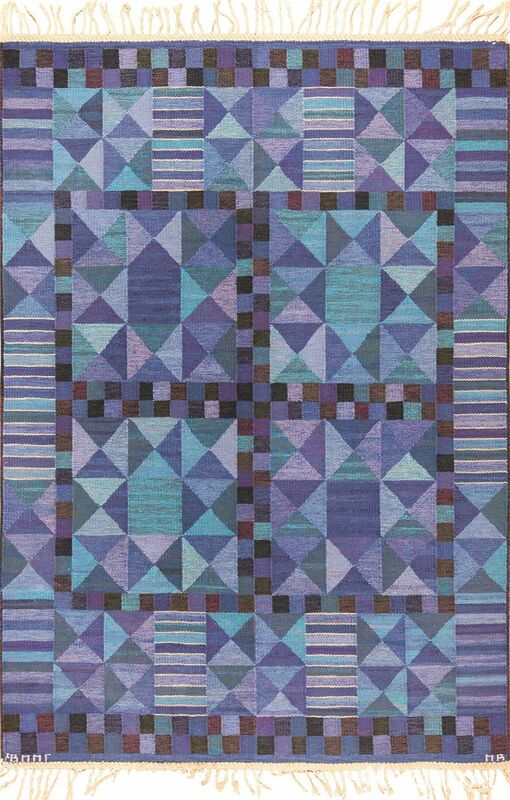 This vintage Moroccan rug features a series of colorful rhomboid figures linked in an abstract all-over pattern. This graphic vintage mid-century rug created in Morocco depicts a grand compartmental pattern decorated with colorful checkers and bold walnut brown dividing lines.